31 October 1914 was the day the war of movement on the Western Front stopped. Afterward, there would be no big breakthroughs until 1918, and 41 months of stagnant, but bloody, trench warfare would ensue. By mid-day on 31 October 1914 there were no more flanks, just one last gap in the entire line from the Swiss border to the English Channel where a breakthrough seemed possible. It was at a place five miles east of Ypres on the grounds of Gheluvelt Chateau, just north of the Menin Road. 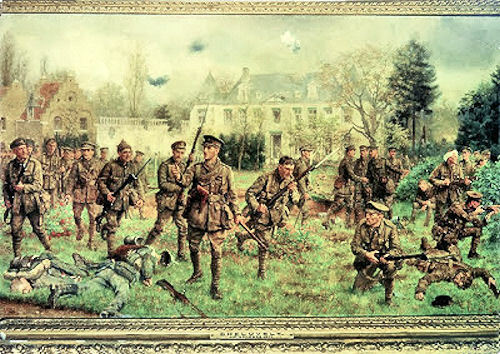 Shortly before noon, the line of the British 1st Division was broken at Gheluvelt. If at that moment German reinforcements available close at hand could thrust through the gap and spread out fanwise, they could have rolled up the defenders on either flank in their rear and simply broken the cohesion of the British in Flanders to pieces. The impulse of retreat began to seize the British troops. Already men and guns were streaming back toward Ypres. The Germans quickly assembled 13 battalions for a final follow-through attack. General Charles FitzClarence, commanding the British Army 1st Brigade, was nearby and saw the declining situation. At Polygon Wood north of Gheluvelt, he got hold of the 2nd Worcestershires, part of the reserve of the 2nd Division on the north, and ordered them to counterattack immediately. This movement had scarcely begun when a shell burst in Hooge Chateau, where the staff of both divisions had assembled for a conference, practically destroying them. But the Worcestershires—a tiny force of eight officers and 360 men—swept all before them nonetheless. They fell upon their adversaries, who were mostly Bavarians, and drove them back in confusion from the chateau grounds. The line was reestablished. The Western Front of the Great War was effectively completed. General FitzClarence, sadly, did not have much longer to live. He died on 11 November 1914 in fighting along the Menin Road, where many more would fall in the remaining four years of war. The years of trench warfare gave the general staffs time to study the problem of breaking the trench lines and conduct experiments—almost all of which failed—to accomplish this. By 1918, however, the combatants all had solutions they thought would do the trick, some combination of infiltration tactics, better artillery registration, shorter and more intense barrages of high explosive and gas, tanks, better coordination of infantry, engineers, artillery, and logistical support, etc. 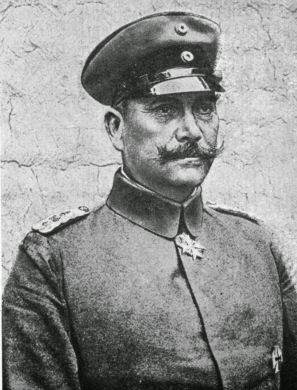 The first general to apply his new "package" of trench-busting techniques was German Quartermaster General Erich von Ludendorff. He planned to defeat the British Army north of Paris and then force the French to seek terms. His staff was instructed to develop a series of offensives targeting either the British directly or the French to fix them in place, reluctant to send reinforcement to their Allies. There were five major attacks that came to be called the "Ludendorff Offensives"—one each month from March to July–—and one for August that was canceled when the French and Americans launched the first Allied counteroffensive of the year. 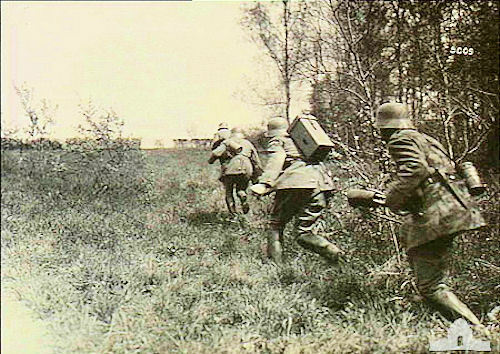 The first, and most memorable, German operation of 1918, Operation MICHAEL, was launched in the Somme sector on 21 March. We will be covering the Ludendorff Offensives in all the publications of Worldwar1.com in the ensuing months, but the initial success of MICHAEL stunned the world, not to say the British Army. In Ludendorff's package of solutions, the key was artillery. Col. Georg Bruchmüller, an obscure officer retired for nervous problems in 1913 but recalled to duty for the war, developed German artillery techniques to a fine art by the time of the Ludendorff Spring Offensives of 1918. The essence of the Bruchmüller artillery preparation was a carefully orchestrated, short but intense bombardment designed to isolate, demoralize, and disorganize enemy defenders. What was the German automatic rifle referred to? Who Was Admiral Friedrich von Ingenohl? Who Was John Purroy Mitchel?